The Participant Observer recipe of the month is for Danish Smørrebrød. These little open-faced sandwiches are indicative of Danish culinary identity much like frikadeller (pan-fried meatballs), herring and rødkål (stewed red cabbage). This year-round favorite showcases versatility and tradition in a compact and flavorful package. The term smørrebrød is a composite term. The word comes from “smør og brød,” Danish for “butter and bread,” and reflects it’s humble origins. As the story goes, 19th-century Danish factory workers began eating midday meals at work rather than home, which meant bringing dinner leftovers. These cold items were accompanied by the hearty and ubiquitous rugbrød (rye bread) and made for filling open-faced sandwiches, making the most of a household’s food. Over the generations, these sandwiches have shrunk to almost bite-sized items featuring sweet, savory and salty toppings. Using assorted leftovers for smørrebrød allows for significant variations. Toppings, or pålæg, can be comprised of Scandinavian classics like pickled herring (marinerede sild), cured meats, pork-liver pate (leverpostej), smoked fish, pickles, tomato, boiled eggs and a number of other items. These toppings often reflect a sense of seasonality with items like smoked mackerel and cucumber-radish salad being summer favorites, while red cabbage and roast pork heralding Christmas. Practically anything can be put atop a piece of rugbrød and labeled smørrebrød. While the combinations are endless, Danish culinary etiquette plays a role in the manner and sequence smørrebrød are assembled. Custom dictates that mixing protein types on one bread is taboo, seafood should be followed by meat then cheese (often resulting in different plates and sets of silverware in restaurants), and bulky items should be the last to top the bread. It is ironic that a dish that allows for considerable freedom in allowable ingredients is highly regimented in its manner of preparation. For those of us without the Danish cultural background this may not be important, but for Danes the unspoken rules of preparation are as important as the dish itself. In the end harmony is the ultimate goal and ingredients should complement each other and not overpower. The recipe below seeks to achieve this aesthetic. Key to any traditional smørrebrød is the particular type of rye bread used. It should be a heavy, dense, whole grain and seeded rye, not the soft deli-style rye common here in the states. Pumpernickel is a good choice. If alternative breads are used it is best if they are also dense and solid and able to handle the array of toppings. Unlike sandwiches eaten in the US smørrebrød are customarily eaten with a fork and a knife, rather than hands and butter is almost always spread on the bread. Smear rye bread witha generous layer of horseradish sauce (see below). Add sliced radish and dill. Season lightly with salt and black pepper. * French breakfast radishes are similar to common red radishes but they are more oval in shape and milder in taste. Combine all ingredients in a non-reactive bowl until smooth. Smear butter in a thick layer onto the bread. Finish with thinly sliced green onion. Combine all ingredients in a bowl and mix until smooth. Using a knife or a mandoline, slice the cucumbers into very thin (2mm) rounds. Place the slices into a large non-reactive bowl and add salt, tossing gently to combine. Let the cucumbers cure for 15 minutes. Drain excess moisture from the cucumbers by gently pressing the slices down with your hand and pouring off accumulated water. Transfer the cucumbers to a jar and cover with the brine. Let the mixture sit two hours before eating. The cucumbers will keep for about a week without losing their texture. In a large pot, bring water to a boil and whisk in sugar until dissolved. If using, add pickling spices to the boiling mixture and simmer for 10 minutes. Cut the heat and stir in vinegar to combine. Cool the solution to at minimum room temperature before using. 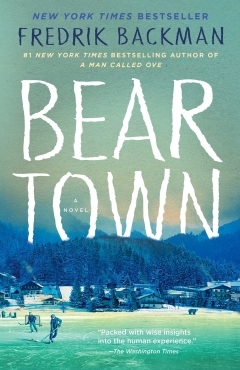 So begins Beartown, a novel that surpasses even A Man Called Ove, the author’s previous international bestseller. Set in a small town in Sweden’s backwoods, it reads like a thriller, keeping the reader glued to the pages long into the night. The plot involves two very different generations: the teen-age players of the town’s hockey team and their adult fans and parents. Its appeal is thus to young adults and older adults – even seniors such as this Worldview Project reviewer. Glowing reviews from the New York Times and Washington Post are surpassed by the usually laconic words of Amazon’s critic, as follows.